Fuso warrants that your new Truck or Bus and any part of your Truck or Bus (except tyres, custom made rear body or non approved after market modifications) shall be free, under normal use and maintenance, from defects in material and workmanship, subject to the terms and conditions contained in this document. For the initial warranty periods and kilometres specified below in relation to each vehicle from the Warranty Start Date, any part of your vehicle, as originally installed, which proves defective in normal use and maintenance, will be repaired or replaced at no charge for parts and labour by an Authorised Dealer, using Genuine Fuso Parts. 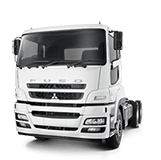 Any Genuine Fuso Part repaired by an Authorised dealer is covered only for the then remaining term of this New Vehicle Warranty. Any Genuine Fuso Part replaced by an Authorised Dealer will be covered for the then remaining term of this New Vehicle Warranty or for the term of the Genuine Fuso Parts Warranty, whichever is longer. Please Note: The New Vehicle Warranty applies only to trucks and buses registered and operated in normal conditions in Australia. *Vehicles operated in severe service applications, such as off road, underground mining, crop spraying or on beach use are warranted for 12 Months / 50,000 kilometres (whichever occurs first). This New Vehicle Warranty does not cover the following repairs, services or damages even if they are required or occur during the term of this New Vehicle Warranty. Any vehicle on which the odometer (or hourmeter) reading has been altered. Repairs required as a result of air-borne fallout, chemicals, tree sap, salt, road hazards, hail, windstorms, lightning, floods, other acts of God and environmental conditions. Repairs required as a result of fire, accidents, abuse, negligence, neglect, damage due to objects striking the vehicle or misuse or misapplication of the vehicle such as driving over kerbs or overloading beyond the specified vehicle weight rating, racing, etc. Replacement of parts such as fuses, bulbs, wiper blades, hoses and belts which wear out under normal use. Maintenance services (cleaning, lubrication, and parts which are normally or periodically replaced such as filters, worn brake and clutch linings, etc.) and which are the responsibility of the owner to provide as set forth in the maintenance schedules in the Warranty & Service Schedule Book. Repairs required due to the failure to provide adequate and proper maintenance as recommended in the Warranty & Service Schedule Book. Repairs due to failure to use recommended fuel, oil and lubricants as set forth in the Warranty & Service Schedule Book. Incidental or consequential loss or damage of whatever kind such as loss of use of the vehicle, loss of time, inconvenience, expenses for fuel, telephone, towing*, travel or lodging, loss or damage to personal property, commercial loss, loss of revenue, penalty rates, downtime, freight loss or other items not specifically included within the terms of this New Vehicle Warranty. Continued operation of the vehicle after it is known to be defective. Repairs due to the fitting of parts or accessories not approved or marketed by Fuso. * Reasonable ‘towing’ charges may be approved to the nearest Authorised Fuso Dealer in the event of a breakdown should the owner not be covered by Insurance or an Auto Club. Subject to any non-excludable statutory provision to the contrary, Fuso and its Authorised Dealers shall not be liable for incidental or consequential damages resulting from breach of this warranty. This New Vehicle Warranty starts on the date of original retail delivery or original use of the vehicle, whichever occurs first. Your Authorised Selling Dealer will inform you of any addition or modification made to your vehicle prior to delivery which has not been approved by Fuso. Any addition or modification made to your vehicle before or after delivery which has not been approved by Fuso, will not be covered by the terms of this New Vehicle Warranty unless Fuso, in its sole judgement, determines otherwise. However, if any such addition or modification affects the design, vehicle performance, mechanical operation, safety or structural integrity of your vehicle or causes the failure of a Genuine Fuso Part, any failure resulting from such addition or modification will not be covered by this New Vehicle Warranty. Fuso and its Authorised Dealers reserve the right to make changes in vehicles built and/or sold by them at any time without incurring any obligation to make the same or similar changes on vehicles previously built and/or sold by them. Defects in paint, trim or other appearance items are normally noted and corrected during Pre-delivery Inspection. For your protection, it is suggested that should you find any paint or appearance item which you suspect is a defect, advise your Authorised Selling Dealer without delay, as normal deterioration due to use and exposure is not covered by this New Vehicle Warranty. 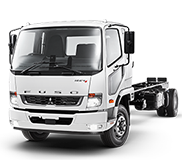 To obtain warranty service, your vehicle must be returned to your nearest Authorised Fuso Dealer where such service will be performed by the Fuso Authorised Dealer in accordance with the terms of this New Vehicle Warranty. If your vehicle becomes inoperative and cannot be moved under its own power, contact your nearest Authorised Dealer and follow their instructions. If you should have warranty service performed on your vehicle, you are entitled to receive a copy of the repair order listing the warranty service performed. Tyres on your vehicle are covered by a separate warranty provided by the tyre manufacturer and are not covered by this New Vehicle Warranty. For specific tyre warranty information, contact an Authorised Local Dealer representing the manufacturer of the tyres installed on your vehicle. Batteries are covered for 12 months only. The paint work on the cabin and chassis is covered for 12 months only from the warranty start date of the vehicle. Fuso supplied bodies as fitted to the Built Ready Range is covered by 1yr / unlimited km warranty. 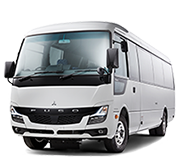 The custom made rear body, aftermarket modifications or special equipment on your Fuso vehicle are not covered by the New Vehicle Warranty. For specific rear body warranty information, contact your Authorised Selling Dealer. Where a vehicle is used for periods of time stationary with the engine or transmission power take off (PTO) engaged to provide power then it is required to install an engine hourmeter to record the operation hours. 1 hour = 50 km. Fuso warrants to the retail purchaser that Genuine Fuso Parts* sold or installed by an Authorised Dealer shall be free, under normal use and maintenance, from defects in material and workmanship, subject to the terms and conditions contained in this document. * As defined in the Fuso New Vehicle Warranty. The Genuine Fuso Parts Warranty is 12 Months/Unlimited Kilometres from the date of purchase or 24 Months/Unlimited Kilometres if the part is installed in an authorised Fuso dealership. When the part is purchased over the counter from an Authorised Dealer and a warrantable failure occurs, Fuso will cover the cost of the failed part. 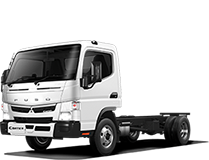 If an Authorised Fuso Dealer has installed the part and a warrantable failure occurs the part and labour for replacement will be covered by the Genuine Fuso Parts Warranty including any other Genuine Fuso parts directly affected by the failure. Any Genuine Fuso Part repaired by an Authorised Fuso Dealer will be covered only for the then remaining term of this Genuine Fuso Parts Warranty. This Genuine Fuso Parts Warranty applies only to Genuine Fuso Parts. This Genuine Fuso Parts Warranty does not cover an item listed under ‘What Is Not Covered’ of the Fuso New Vehicle Warranty. The 'Other Terms' Stated in the Fuso New Vehicle Warranty also apply to thie Genuine Fuso Parts Warranty. To obtain warranty service, the purchaser must return the defective Genuine Fuso Part to an Authorised Fuso Dealer and furnish the Authorised Fuso Dealer with the purchaser’s copy of the repair order of the Authorised Fuso Dealer installed Genuine Fuso Part, or the purchaser’s copy of the original sales slip on ‘over the counter’ sales of such part. Fuso reserves the right to inspect the failed parts before accepting a claim for Genuine Fuso Parts Warranty. The best way to preserve your vehicle’s finish and aid in avoiding rust is to keep the vehicle clean by washing it frequently. Wash the vehicle only with lukewarm or cold water. Do not wash the vehicle in the direct rays of the sun, or use strong soap or chemical detergents. Any cleaning agents used should be washed off properly and not allowed to dry on the finish. Calcium chloride and other salts, ice melting agents, road oil and tar, tree sap, bird droppings, chemicals from industrial chimneys and other foreign matter may damage the vehicle’s finish if left on painted surfaces. Prompt washing may not completely remove all these deposits. Additional cleaners may be needed. When using chemical cleaners developed for this purpose, be sure they are safe for use on painted surfaces. Corrosive materials used for ice removal and dust control can collect on underbody surfaces. If these materials are not removed, accelerated rusting can occur on the underbody parts such as fuel lines, frame, floor panel and exhaust system. At least twice a year, and more frequently in climates where road salt is commonly used, thoroughly flush these materials from the underbody with plain water. Take care to clean areas where mud and other debris can collect. Any stone chips, cracks or deep scratches in the finish should be repaired promptly. Bare metal will corrode quickly and can develop into a major repair expense.